The Dominican Republic is the most visited destination of all the Caribbean islands. And while it’s best known as a vacation destination—a place to unwind and let the stresses of the world melt away—some are making this tropical paradise their full-time home. 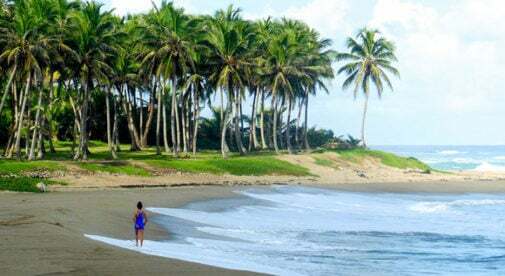 Two Dominican Republic coastal havens popular with expats are Cabarete and Las Terrenas. They’re culturally vibrant places where you’ll meet expats from more than 50 countries. Dominican beaches are among the best on earth. Imagine pressing your feet into fine warm sand. Or feeling tropical water pass and swirl around your body. And after your swim, noticing how the palm fronds dance lightly in the breeze just before dozing off in your beach lounge. Even beach snobs, who’ve been everywhere and done it all, extol the beaches of the Dominican Republic. And there’s more than one way to relax on the beach here. For some, it’s an early-morning walk with their dogs. For others, it’s sharing a late afternoon snack or drink with companions and new friends in one of the many on-the-beach restaurants and bars. With expat chefs from around the world, expect an excellent array of fine dining in the Dominican Republic. Among the expats coming to the Dominican Republic are chefs from many parts of the world. So you can anticipate fresh Italian pastas, French sauces, Spanish tapas, German sausages, and Argentine-style steaks, as well as wholesome local staples like rice and beans with chicken and a salad. 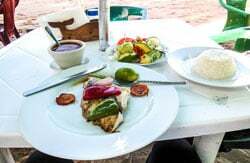 Cooks here have ready access to fresh local sea bass, red snapper, dorado, and sometimes tuna, as well conch, lobster, and shrimp. Produce grown in the Dominican Republic includes avocados, pineapple, bananas, passion fruit, mangos, papayas, Pomegranates, starfruit, tamarindo, guava, coconuts, limes, oranges, grapes, and cashews. You’ll also find locally grown coffee and excellent chocolate made from organic Dominican cocoa. The Merengue originated in the Dominica Republic. It’s a sensual dance that’s easy to learn. In fact, there’s a saying: if you can walk, you can learn to dance the Merengue. So let’s give it a try right now: The main step is to the side. Step to the side—close—step to the side—close. Let your hips move as you step. Lead your side movement with your ribcage. Now, keep time with the music… You’ve got it. The lush mountainous terrain of the Dominican Republic has interesting small roads, paths, and trails. Some lead to caves and waterfalls you can reach hiking or on horseback. In the Cabarete area, you’ll find mountain bike trails. In Las Terrenas, many expats get around, both in town and rural jungle paths, on ATV quads. 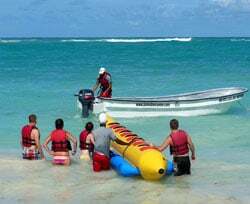 You’ll also find a wide range of water sports in the Dominican Republic including snorkeling, fishing, and even banana boats. Water sports are big in the Dominican Republic. Some expats make a daily swim in the sea a part of their island-life routine. You’ll find kitesurfing in many parts of the Dominican Republic, with some of the best conditions in the world for the sport in Cabarete. Also near Cabarete is Encuentro Beach, home to the best board surfing in the country. And there’s good scuba diving and snorkeling in many parts of the country, too. There are enough English-speaking expats and bilingual locals in the Dominican Republic that you could get by without learning any Spanish. However, learning some Spanish can be fun and will make your life easier. Besides that, the Dominican culture is an especially pleasant one. And it’s definitely worth the effort to learn some Spanish so you can show respect and interact. One way to learn Spanish is to hire a local teacher. Another way is to study with an online home course and then practice when you’re out playing or running errands. Once you learn the basics, you can often work out a trade helping a local with her English in exchange for her helping you with your Spanish. While many expats in the Dominican Republic are content to fill their days relaxing on the beach, practicing a sport, and dining with friends; others, seeking a deeper level of community interaction and an income, start businesses. Most of the businesses in the Dominican Republic successfully run by North American expats are tourism related. They include running a small hotel, starting a restaurant, or setting up a tour company. Many expats have also realized good returns buying and renting out vacation properties. Learn more about the Dominican Republic and other countries in our daily postcard e-letter. 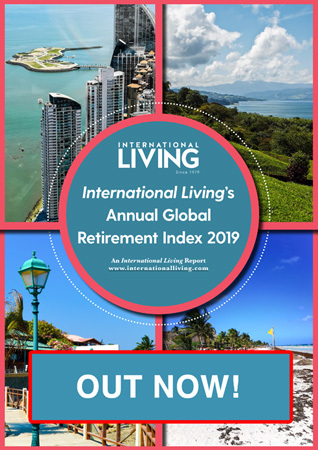 Simply enter your email address below and we’ll send you a FREE REPORT – Dominican Republic: The “Fairest Land Under Heaven” Gives Tax incentives to Retiring Expats. This special guide covers real estate, retirement and more in the DR and is yours free when you sign up for our postcards below.